Creating professional-looking WordPress sports websites has never been easier thanks to the availability of today’s modern sports WordPress themes. Sports teams, health clubs, fitness centers, sporting events, or even just sports fans, can make use of premium sports WordPress themes which offer all of the necessary tools and features to launch attractive and engaging websites. Many premium sports WordPress themes come with high-end features that enable you to organize and showcase your sporting events, fixtures and schedules, standings, news, images, and even merchandise in a nice and attractive way. By using a variety of simple interfaces, you can create engaging and beautiful pages, displaying your content accordingly. Drag & drop page builders, custom shortcodes, flexible widgets, unlimited sidebars, and several selectable layout templates are commonplace amongst many sports WordPress themes that are available for your site. Some sports WordPress themes also offer popular premium 3rd party plugins at no additional cost, giving you even more creative freedom to launch your website. To personalize your website, many sports WordPress themes come bundled with powerful theme options that contain an array of useful options, color scheme editors and many more. You can thus configure your sports websites accordingly, match your site with the colors of your sports teams, present team members, and much more to take your site to the next level. Nowadays websites should look well-organized on mobile devices, that’s also why modern sports WordPress themes come with a fully responsive layout to display your content nicely. By using responsive WordPress themes your visitors are receiving a consistently reliable user-experience no matter which device they may be using – smartphones, tablets, or smart TVs. The sports WordPress themes we’ve listed in this article are customizable in various different ways. You therefore have the ability to personalize your theme to suit your needs and requirements. Via the use of simple colorpickers, you’re for example able to completely customize the color scheme. Logo uploader and background changer interfaces allow you to further personalize your website. 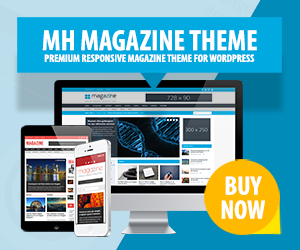 MH Magazine is a versatile WordPress theme which can be used to launch attractive and engaging editorial sports websites. This flexible WordPress theme is ideal for online magazines, news websites or other editorial sites related to sport news, sports teams, fitness, health, and similar topics. Thanks to the great features of MH Magazine, like one or two sidebar layout, several menu locations, awesome custom widgets for social media, YouTube video or else, and a nicely integrated news ticker to display latest headlines from the sports world, you are able to setup professional websites for all kinds of sports topics. MH Magazine can take your editorial website to the next level. The Real Soccer WordPress theme is a comprehensive sports theme specifically for use by soccer or football teams and leagues. This sports WordPress theme offers many great features that provide you with all the tools required to give your sports team a professional and attractive website. With Real Soccer you can organize and present your squad list, player profiles, league table, fixtures, results, and match reports with ease on a regular basis. This powerful sports WordPress theme is suitable for all of today's modern browsers and mobile devices alike. The Real Soccer theme can therefore be a great companion for all football clubs. The Gameplan theme for WordPress is a powerful sports theme with useful features you can use to create professional looking websites. Via the use of 3rd party premium plugins, including Visual Composer and Slider Revolution, and with a wide-range of customization options, you're able to customize the theme to suit your specific needs. An advanced theme options page, several custom shortcodes, and much more are all included with the Gameplan theme out-of-the-box. Splash has been designed for a variety of sport teams and clubs, including football, basketball, soccer, and hockey. Using this sports WordPress theme you can take advantage of a variety of easy-to-use interfaces, and a range of selectable and customizable elements to easily build impressive sports websites with comparative ease. Splash WordPress theme looks amazing on desktop computers, mobile devices and smart TV's alike. You may easily organize and present your sport team's players, schedule, news, results, and match reports with this very powerful yet user-friendly sports WordPress theme. Power Gym WordPress theme is suitable for websites of gymnasiums and health centers offering a cool and attractive design for sports WordPress websites. Being a multi-purpose theme, this powerful WordPress template is ideal for sports teams, sporting events and sports fans. Power Gym comes with useful premium plugins, that not only save you money but also give you the ability to implement cool, stylish elements to your sports website with absolute ease. This sports WordPress theme is further suitable for all of today's modern browsers and mobile devices. The Power Gym theme can be a great solution for anyone wanting a professional online presence. SportAK is a powerful theme for WordPress that offers you the ability to create modern websites or online stores for your sports team. Whether it's football, handball, baseball, rugby, volleyball or hockey, the SportAK WordPress theme supports your sport professionally. You may easily create club sites, magazine sites, or even online stores for your sporty business. A range of selectable layouts, unlimited colors, and a visual page building system, enable you to create a customized sports website that is finetuned for your club. Easily upload your club badge and use your team colors to make your fans feel at home. Symetrio is a multi-purpose sport and fitness theme for WordPress. This professional WordPress template can be used to launch websites for sports teams, personal trainers, fitness clubs, health centers, and gymnasiums. Symetrio is a fully responsive WordPress theme that will display your content nicely on both, desktop and mobile devices. This sports WordPress theme comes with premium features, including a selection of layout variations, an array of pre-configured templates, a vast amount of custom shortcodes, and an advanced theme options panel, that make this a great theme for beginners or advanced users. The Sport WordPress theme is a beautiful and engaging template for sports teams, health centers, gymnasiums, or even sports fans who want to create a professional online presence. This sports WordPress theme offers a powerful theme options panel which includes useful options that allow you to customize almost any element of the theme with no coding knowledge required. Sport comes with several custom widgets included which you can use to present your content accordingly. This sports WordPress theme offers a fully responsive layout that will look neat and nice on all modern browsers and mobile devices. The Champion WordPress theme is a comprehensive sports theme which is ideal for soccer or football clubs, teams, or sports fans. This sports WordPress theme comes equipped with awesome features that enable you to create very attractive sports websites that contain your team's fixture schedule, league position, player profiles, team news, and even merchandise via the use of the popular WooCommerce plugin. Champion comes with all you need for a professional sports site. Champion is suitable for all kinds of different modern browsers and mobile devices. Along with the inclusion of an advanced theme options panel and color scheme customizer, the Champion sports WordPress theme is perfect for modern sports websites. With the Xtreme Sports WordPress theme, you can create beautiful and engaging websites for your sports events, sports clubs, or online sports stores. You can make use of the included high-end features to create impressive online presences in no time at all. Selectable homepage variations, visual page building system, font selection, easy logo implementation, and color scheme selection makes it easy for anyone wanting to create professional-looking websites. The Xtreme Sports WordPress theme looks awesome on all modern browsers and devices thanks to the themes lightweight, responsive framework. The Gameday WordPress theme is a popular sports theme best-suited for sport blogs, magazines, online stores, and news outlets. It comes with a variety of high-end elements, including a sports scoreboard, drag & drop homepage builder, multiple advertisement spaces, and a cool color scheme editor. The Gameday WordPress theme is powerful yet easy to use and suitable for beginners and advanced users. Modern browser and mobile device support is also provided, ensuring your visitors have a high-quality user-experience with each visit. The Sport & Fitness WordPress theme is a powerful solution aimed at providing sports clubs, health centers, gyms, and personal trainers the tools required to create attractive and functional sports websites. This sports WordPress theme is available in a variety of color schemes, and comes bundled with an attractive content slider, several custom widgets, unlimited pricing tables, Google Maps integration, and timetable manager. You're therefore able to create unique online presences that are finetuned for your specific needs. The Sport & Fitness theme is suitable for all modern browsers and mobile devices via the flexible responsive framework, ensuring a consistent user-experience for your visitors. Resportsive WordPress theme is a reliable and powerful theme that comes loaded with high-end features. A drag & drop homepage builder, custom widgets, ticker tape, advertisement options, social media sharing, and an advanced theme options panel, make it easy for everyone of all skill levels to create attractive sports websites. Resportsive theme also ensures your mobile visitors are fully catered for using its flexible framework that is suitable for all tablets, and smartphones. Gym Guide is a powerful sports WordPress theme for fitness centers, gym clubs or related fields. This sports WordPress theme offers many useful features, that enable you to organize and present your facilities, classes, image galleries, and services in an attractive manner. With Gym Guide you can ensure that your website is accessible on all modern browsers and mobile devices. That is essential if you are to maximize the reach of your sports club, fitness center, health service, or gym with the minimum of effort. Sportimo is a comprehensive sports WordPress theme which is suitable for sporting events, sports news blogs and magazines. This versatile sports WordPress theme is perfect to easily create professional websites for all kinds of sport related topics. Thanks to the many included features and options you can create awesome pages with a visual drag & drop page builder, choose from a variety of custom shortcodes, use the unlimited sidebar creator and take advantage of the advanced theme options panel. With Sportimo you can present your sporting news, events, and services in a welcoming and consistent way. With Gym & Fit you may easily create professional sports websites that are suited for any kind of sporting activity, sports club, health center, personal trainer, or gym. This sports WordPress theme comes with several pre-defined layouts, easy event organization, color scheme editor, and a powerful options panel. The Gym & Fit WordPress theme makes it easy for anyone to create functional, attractive sports websites and it's suitable for all modern browsers and mobile devices. Equipo is a stylish, modern WordPress theme that was specifically designed to give sports teams an attractive website and showcase their sporting achievements, events, news, merchandise, and media. You can make use of the high-end features that come supplied with this sports WordPress theme to create stunning online presences for your sports teams. Thanks to the responsive layout, the fans will love visiting your site, no matter which browser or mobile device they may be using. You can further make use of the powerful theme options panel and color scheme editor to customize your sports sites to suit your needs. Upload your club badge, and use your team's colors to match the Equipo sports WordPress theme with your team. Using the Club Sports WordPress theme, you can launch awesome sports websites to present your team in an impressive way. You can take advantage of a range of premium features and user-friendly interfaces. You're also given all of the necessary tools required to create great looking online presences that website visitors can enjoy using, no matter which device or browser is being used. Whether it's for football, basketball, hockey, baseball, soccer, or handball teams, you'll find the Club Sports theme to be a reliable companion that is easy to work with. Customizable via the integrated color scheme editor and advanced theme options page, the Club Sports WordPress theme is a great way for WordPress users of all skill levels to create awesome sports websites. The Sporty WordPress theme is an ideal solution for sports teams to create engaging websites for their fans. Using this sports WordPress theme, you can make use of several great features, including a drag & drop page builder, built-in fixtures and team schedules, sports team showcase, YouTube integration, and premium image gallery. You're therefore able to create stunning websites for sports teams with the minimum of effort. Thanks to its fully responsive layout, Sporty is suitable for a wide-range of modern browsers and mobile devices alike. No matter if you plan to launch a website for your sports team, fitness center, health club, or personal trainer, these sports WordPress themes are perfectly suitable to launch appealing and professional online presences. Be it football, hockey, rugby, basketball, fitness or any other sport – you’re catered for by a variety of high-end premium themes for your WordPress website. Presenting team statistics, squad members, match reports, and player profiles, in a stylish and engaging manner is a great way of making that all important first impression on your visitors. Give your team a winning start to the season with a high-quality premium theme for WordPress.